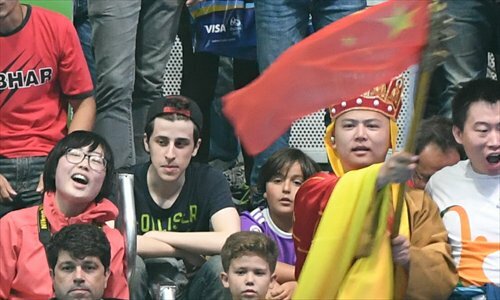 The ongoing Rio Olympic Games is probably the most relaxed games ever for China. Chinese audiences are decreasingly seeing medals as the paramount goal, and underperforming athletes are calmer when they end up with unsatisfying results. But in a country where athletes are funded by the government, whether athletes should simply enjoy participation remains controversial. Halfway through the Rio de Janeiro Olympic Games, the Chinese national team has only won 15 gold medals, putting it in third place in the gold medal tally, after the US and the UK. The country came in second place in the medal rankings in 2004 and 2012, and even top in 2008, so this year's haul has upset the sports authorities. Gao Zhidan, vice director for General Administration of Sport of China, said Monday that Team China encountered "unprecedented" challenges and difficulties in Brazil. However, the Chinese public are not going to share and spread the disappointment this time. When the swimming team landed in China Tuesday, in spite of their less-than-expected performance, they were welcomed with flowers and applause in the airport. The rise to fame of swimmer Fu Yuanhui shows this new attitude to athletes. Fu might have expected to win some fame if she brought home a gold medal. However, the bronze medalist has become famous in China and across the world for her enthusiasm and candid personality. Fu made headlines internationally with her charming response to winning a medal in the women's 100-meter backstroke, exclaiming "I'm so fast! "and joking that she used her "prehistoric powers" to win. Later, she admitted that her performance in another event was hampered by the fact she had started her period the night before. This took many Chinese viewers by surprise, as they are used to their athletes focusing in interviews on their desire to win glory for the country. This phenomenon would have been hard to imagine four years ago in London. In a country where people have long been gold-medal obsessed, Fu's popularity and the understanding expressed by many about the lack of podium glory on the games' first day and toward the failures of celebrity athletes Sun Yang and Ning Zetao have been seen by some as signs that Chinese audiences now see the Olympics more as entertainment than as a platform for proving China's worth. But this new attitude has not been accepted by everyone. While many people are circulating emojis that look like Fu and showing sympathy to athletes who didn't get the top spot, some are arguing the public has "overcorrected." "[They] spare no efforts in praising those irresponsible athletes. The audience for this Olympic Games are severely unqualified in terms of IQ," an author named Chenghuai Laoren wrote in a widely shared WeChat article. Some maintain that sportspeople whose training is paid for by the public should prioritize winning medals over anything else. This argument has raised questions over the system by which Chinese athletes are trained, which is entirely reliant on government funds. "Do we still need the national system right now?" many netizens asked in bewilderment on Sina Weibo. Many people online have said that the athletes at this year's games are lucky to have such a tolerant audience at home. Swimmer Sun Yang, who was expected to do well and even said he was "the king" before the games, eventually failed to make it to the final of the men's 1,500-meter freestyle, later blaming a cold. But instead of facing anger, he was met with widespread understanding. "Medals can be won another time, but there is only one Sun Yang. Take care! See you in four years!" one netizen posted on Sina Weibo. Compare that reaction to what hurdler Liu Xiang suffered at the Beijing Olympics in 2008. After Liu won a gold in the 2004 Athens games, the expectations on his shoulders became crushingly heavy. So when Liu dropped out of the 2008 games due to injuries, and then, sit beset by injuries, failed to do well in London, Chinese audiences branded him "the shame of the nation." The public relaxation has been mirrored by the competitors. 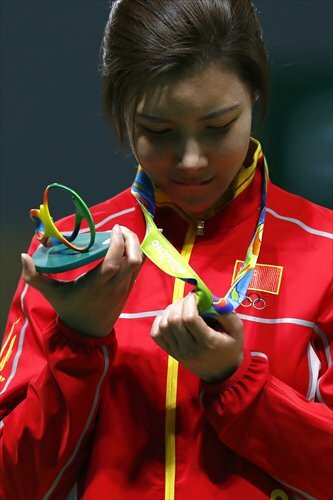 Yang Haoran, another athlete that has failed to live up to high public expectations at the Rio Games, told the media that "There are other things in life besides the Olympic Games." Many media reports have explained this change in terms of the country's international standing, claiming that China has gained confidence to the point where it can discard its previous focus on medals. 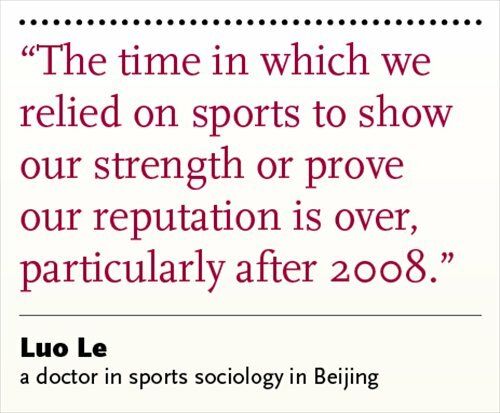 "The time in which we relied on sports to show our strength or prove our reputation is over, particularly after 2008," said Luo Le, a doctor in sports sociology in Beijing. "It is not only about sports. There is a trend of entertainment in our society. Such entertainment is also manifested in other hotspots of society before the Rio Olympics," Luo told the Global Times, "As manifested in Rio, people care more about funny news and titbits, like Fu's expressions. The media also plays a role in guiding the public toward the direction of entertainment." The backlash against this attitude is largely based around the idea that the athletes are not repaying the investment the country has made in them. Swimmer Ning Zetao, a popular heartthrob who has been nicknamed "the national husband" online, sparked a storm on Sina Weibo when he said that he was just happy to take part in the Olympics after failing to win a medal. "The country and the people paid money to train you to let you be happy? 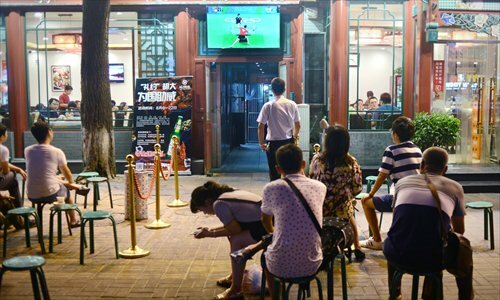 … You used people's hard-earned money to come here to play … it is not so-called releasing pressure, it is releasing shame," a netizen called Jiexi commented, a view echoed by many. "The previous adoration for gold medals might be too exaggerated, but now are these little fresh meat (online slang for attractive young men) going too far being so relaxed in front of failure?" wrote Chenghuai Laoren on WeChat. Citing data about the money and resources China invests in the Olympic Games and the value of every gold medal, Chenghuai Laoren argued that "the athletic skills every athlete possesses are half owned by the State." The writer even criticized journalists who have praised the public's changing attitude towards the Olympics, writing "We have invested so much, it is wrong to say that joy is most important in the process. Fighting for gold medals is their obligation." Some were angered by Sun Yang's claim that a cold prevented him from doing better. "We taxpayers have invested millions of yuan in Sun's training in Australia, now he lost the gold medal over a cold? What's wrong with the team doctor? Who will explain this?" an author named Xiaoxin wrote on New Weekly magazine. "Behind every Olympic athlete is huge investment [from the country]. Isn't it reasonable to expect them to fight for No. 1? Why can't we complain about it? Why is everyone talking like Sun Yang's mum, telling him 'don't cry'?" Xiaoxin added. In Luo's eyes, the spirit of enjoyment in which Chinese audiences are increasingly judging athletes is a return to the true spirit of sports. "The enjoyment of sports and the national system, as to how the country trains sports talents, are not related actually," Luo told the Global Times. However, as many critics are using the publically-funded sports system to attack the relaxed attitude of some athletes, the national system is again under the spotlight. Established when China's economy was entirely planned, the national system, based on the Soviet Union's sports program, sees national glory as the top goal. All athletes that are selected to be either regional or national athletes are treated as State employees and depend on the government for their livelihood. While some are now criticizing this system on the basis that the pressure to win medals for the country strips the joy of sports from athletes, the system has long been controversial amid accusations of corruption, its bloated bureaucracy and the fact that many athletes are simply abandoned upon their retirement with no skills applicable to the job market. But some experts have argued that switching to a self-funded, market-led system may not be appropriate for China today. Chu Yin, professor from University of International Relations, points out that the system "provides more possibilities to children from ordinary families and is thus fairer than the sports system in the West." "It is almost impossible for China to develop expensive sports like bicycling, sailing and tennis without the national system," Chu told the Global Times, "As I observe, the biggest advantage of the system is not grabbing more medals. Rather, it is to let more poor people change their fate through sports. Our society needs this channel." To Luo, it is not proper to completely reject the national system. He says that despite its flaws it has many advantages that "some developed countries even want to learn from." "On the other, it is very complicated in practice, not a black-or-white thing. A new system, like a market system, may result in its own problems in reality," said Luo.